There was no complimentary coffee at New Roads High School on Thursday night. “At least they could have had the sous-vide egg bites,” groused one man who had come to watch Starbucks founder Howard Schultz speak with journalist Maria Shriver. But even without refreshments, dozens of MBA-types, adoring Starbucks employees, and curious politicos crowded the Santa Monica private school’s auditorium for over an hour of friendly banter between the billionaire tycoon and the millionaire Peabody-winner. 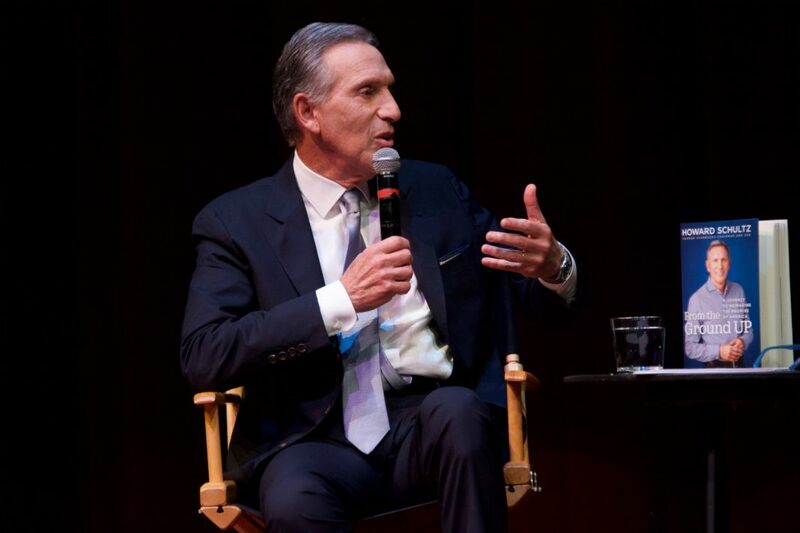 While the event, hosted by Live Talks Los Angeles, had been billed as a discussion of Schultz’s new book, From the Ground Up, he mostly used the stage to respond to the last three weeks of heavy criticism he’s faced since announcing a potential presidential bid. More than just the level of heat, the source of the heat surprised Schultz. Perhaps because of President Trump’s own (disputed) status as a billionaire, the very existence of billionaires has come under a higher level of scrutiny in the last few years. Galvanized by unapologetically liberal voices like Alexandria Ocasio-Cortez and Bernie Sanders, left-leaning voices have drawn a connection between the unprecedented accumulation of wealth and soaring income inequality. In a clip that went viral earlier in the month, Schultz seemed to display an out-of-touch hypersensitivity to his own wealthy status when he pushed back against the use of the term billionaire and substituted the phrase “people of wealth.” Social media went crazy. The discussion was light on policy. Instead of pointing to specific shortcomings or solutions, Schultz blamed an absence of focus “on the long term” for America’s struggles. “If you go to China, where I spent so much time of the last 20 years trying to build Starbucks, they have a 20-year plan, they have a 30-year plan, they have a 50-year plan on something called One Belt Road [sic], which is this super, super infrastructure tying all these countries together for trade.” China’s One Belt, One Road project, a $1 trillion initiative to link the economies of Asia, Europe, and Africa, includes ambitious infrastructure investments in over 60 countries. When pressed to for an explanation, Schultz pointed to the $22 trillion national debt. “That does not give us the flexibility to think long term,” he argued. But Schultz explained that his presidential ambitions come from a sense of civic responsibility. “That’s why I want to run for president,” he concluded, ceding the floor to credulous applause. California Congressman Eric Swalwell Is Running for President—but Why?